In the fifth pAsuram, AzhwAr is meditating upon the great quality of emperumAn who assumed the form of an animal [boar] as per the need and saved the earth instead of abandoning it thinking “let me create a new universe like this”, when the universe, created by him, was consumed by deluge. Subsequently, AzhwAr mercifully explains the incident of SrI varAha, who is the friend-in-need, who transformed himself to save the earth, beyond recreating the universe after deluge. sUzhalgaL sindhikkil mAyan kazhal anRich chUzhvarO? sUzhvarO – will consider as refuge? emperumAn appeared in the beautiful form of SrI varAha as said in “kOla varAham“, dug out the earth, not to lose its form due to the delay in time, which went deep down to the shell of the universe, being submerged in the boundless ocean of deluge, with his tusk which is a small area in his divine form and kept it there. Even after hearing about this through vEdham, ithihAsa, purANa etc and even after mediating upon the noble paths which will be the means for salvation, when thinking to analyse, will one consider as refuge anything other than the divine feet of the one with the varAha form, who performs amazing acts? sUzhalgaL sindhikkil – When thinking about the means to eliminate self-dependence and to be uplifted. [Alternative explanation] When thinking about the means to fulfil one’s desires. mAyan kazhal anRich chUzhvarO – When all the entities to be protected are together [in a helpless state], emperumAn will ignore about caring for himself and will focus on protecting others. Will they seek as refuge anything other than such emperumAn’s divine feet? Azhap perum punal than uL azhundhiya gyAlaththai – Saying “earth being submerged in deep ocean”, “deeply submerged in the vast ocean”. azhundhiya gyAlaththai – The earth which went and got stuck to the wall of the universe. thAzhap padAmal – not to hit the ocean bed; not to lose its form. After having submerged inside and losing some portions, not desiring to lose the existence itself. than pAl oru kOttidaith thAn koNda – One who kept the expansive universe on his tusk like a blue gem; placing the earth in a small area on his tusk. Just as a generous person will cook for hundred persons while desiring to feed only forty persons, the tusk is so great that it is much larger than what is to be protected; instead of protecting through someone else, emperumAn protected the earth himself. thAn koNda – It was not done by him as a result of a prayer from the earth which was losing its portions [done by him on his own desire]. 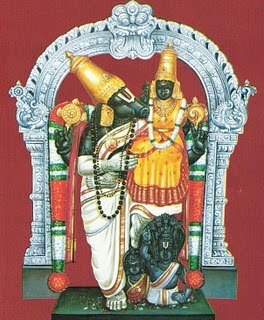 kEzhal thiru uru AyiRRu – The form emperumAn assumed to cause disrepute to himself, became so beautiful that one has to ward-off evil eyes. As emperumAn cares less for his appearance for the protection of his devotees, that itself gives him more radiance; as said in nAchchiyAr thirumozhi 11.8 “mAnam ilAp panRiyAm thEsu” (radiance due to his assuming the form of a humble pig). “mAsudambil nIr vArA” (muddy water dripping from his dirty form) – assuming a form, where all the dirt is on his body. “mAnam ilAp panRiyAm” – his supremacy is not even visible slightly. emperumAn is having such internal emotions that when other pigs get closer to him, and smell him, they become convinced that “this is one among our herd”. When mArIcha assumed the form of the mystical deer, other deer which smelt it, ran away sensing the demoniac smell. “panRiyAm thEsudaiya dhEvar” – Had he not assumed this form, he would have lost all the hard earned radiance/fame. The greatness of lowering himself which is greater than presenting himself for the nithyasUris in paramapadham. kEttum uNarndhumE – Will those who analyse the means, by hearing and meditating, surrender unto anything other than the divine feet of mAyan (amazing emperumAn)? In comparison to giving up his own divine form and assuming a lowly form, to save the earth which was consumed by deluge, is the act of creating the universe with his divine vow, without minimising any of his qualities such as being the cause of the universe etc, a match? This entry was posted in thiruvAimozhi, thiruvAimozhi 7th centum on September 8, 2018 by Sarathy Thothathri.